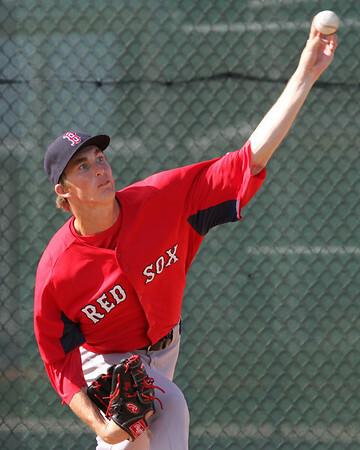 After stringing together nearly 20 consecutive no-hit innings, left-handed pitcher Henry Owens will be promoted to Double-A Portland, according to WEEI.com's Alex Speier. In his last start for the High-A Salem Red Sox, the 6'7" lefty saw his 19 1/3 inning hit less inning streak snapped. In 20 starts at Salem, the 21-year-old put up an 8-5 record and a 2.92 ERA in 104 2/3 innings. The fourth ranked prospect on SoxProspects.com also racked up 123 strikeouts against 53 walks all to the tune of a .180 batting average against. Owens, who was selected in the supplemental round of the 2011 draft, has a deceptive delivery, which adds some jump to his low-90's fastball. This season, he has become more consistent with his high-70's change-up, which has become a swing-and-miss pitch. Owens also throws a low-70's curveball, which shows flashes of becoming a solid pitch. Although Owens has exceeded his innings total from his 2012 season in Greenville, Speier reports the team feels comfortable giving him approximately five more starts in Portland.